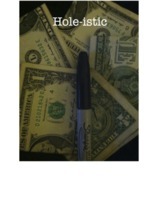 Today, when you order "Hole-istic by Chris Perrotta", you'll instantly be emailed a Penguin Magic gift certificate. You can spend it on anything you like at Penguin, just like cash. Just complete your order as normal, and within seconds you'll get an email with your gift certificate. The Pen thru Bill has been a classic of magic for quite a while now. Unfortunately it has not evolved much over the years. Imagine having the ability to walk up to any spectator and ask to borrow a dollar bill. Pull out a sharpie and have them sign their name right across the bill. Without switching the bills , visually penetrate that bill with the sharpie. 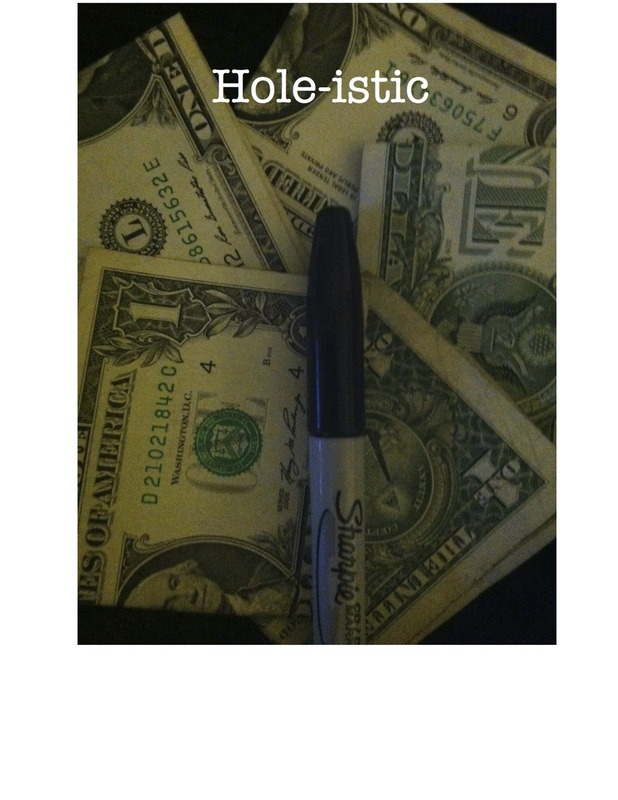 Next remove the sharpie from the bill to show that the hole has visually restored itself. Hand everything back to them, the bill and sharpie are 100 % examinable ! Finally, you are able to do the pen thru bill without having to carry around a gimmicked pen with you. Not only that, with Hole-istic you have the ability to slowly and visually penetrate the bill while the spectators signature remains in Full View the entire time. Then visually restore the hole while removing the sharpie to finish. Ok, lets start of by saying that I really wanted a pen thru bill for quite a while now. I didn't mind the magnet pen, exept for the fact that it is inexaminable and looks like crap, I mean sorry guys but the stealh pen does not look ordinary. I was minutes away from making an order and stumbled upon this. So lets kick off the actual review. As far as I see, I can't find any. I have to say , aside from a few exceptions , there isn't much on the market for less than 10$ that can accomplish such an amazing effect. I love the fact that for 10$ i have an effect that i will use for years to come. It takes a little practice to get the handling perfect but well worth it. I take this with me everywhere i go now. Keep up the great work! thanks. This is truly a wonderful idea that I will be using for years to come. Well worth the price and the time I have into this. No more using a gimmicked pen for me. This truly looks and feels like magic and gets great reactions. After seeing Pen through finger, I thought this might be something similar that you can create a great illusion without being prepared because sometimes it's good to know some tricks that does not involved gimmicks. Well this trick does use a gimmick and you have to be prepared when you're going to perform it. The cool part is that the idea is to penetrate a pen to a signed billed and both pen and signed bill can be examined at the end. I like it. It is worth the money. It is a different approach to the old effect. WAY TOO MUCH arts and crafts to make a gimmick when this can be done almost IMPROMPTU with a playing card and a pen. If you dont own ALL the tools required to manufacture this effect, be prepared to go out an purchase them. Add the cost of all the items and the price of this download and its almost the cost of STC. It will also take you around 20 minutes to put together. Its priced a little too high, should be under 5 bucks. This is a really good idea that could be thought out more. The gimmick is a arts and craft project and if you are not accustom to that, you are going to give up easily, but if you like a project, keep reading. The way the gimmick is rung in and out is less than desirable and should of been thought out better, You are left really dirty in the beginning and the end. But like I said if this was given just a little more thought this could be a killer effect all the way thru. Now lets actually talk about the effect. I have never ever liked the buttery smooth entrance a pen or bill or card makes into another object, it does not look real, it looks fake. He says in the download and the actual product description that the "idea of a pen thru bill has been around a while (ummm John Cornelius) but not much has been done to evolve it" I think there is a reason for that, I mean how many of us remember when John pushed that *** pen thru that bill and you could hear the rip and SEE the actual frays of the bill where the hole was? I bought one instantly from John. There is a reason it has not been improved , because so far no one has ever been able to come up with a version that can beat johns, john just took it to that next level. And yes john used a gimmick pen, but it was self contained and it was easily switched when they were crawling around that bill looking for the evidence for the hole. With Hole-istic, as presented on the download, there is no justification to go back into your pocket, or anywhere else to ditch what you need to ditch. I believe that with a little more thought and knowledge this could of been a hit, unfortunately with where it stands now even at $9.95 it is not worth your time and money for a method that is sub par at best.